Welcome! If you found this page, that means you or someone you know found my little present! Today (September 1st) is International Art Drop Day, where artists all over the world are leaving little gifts for people to find. Just check out out the hashtag #ArtDropDay in Twitter, Instagram and most likely Facebook as well to see what else is going on. Or you can go to this page where it all started. And now for just a quick little mention about how this little figurine was made. I Originally started out with a sketch. 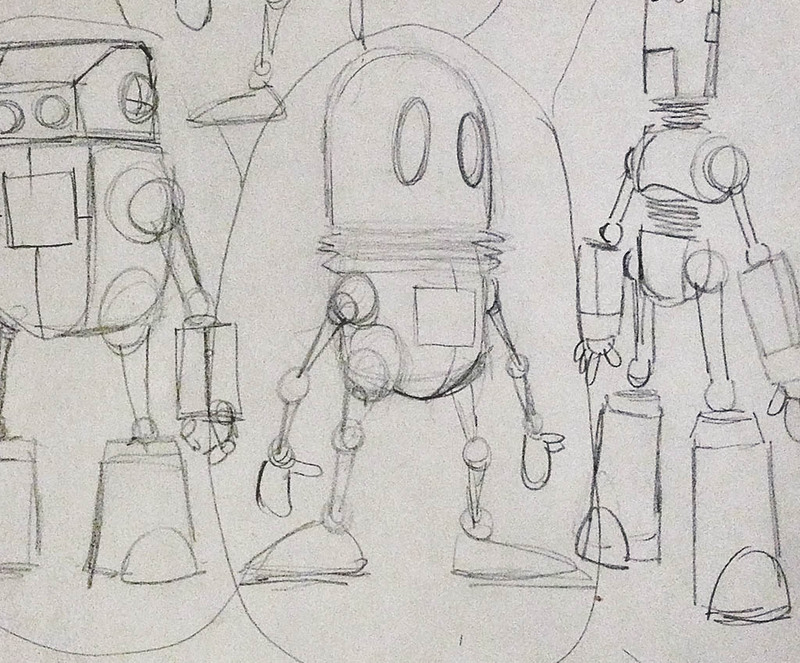 I sketched out quite a few different robots until I settled upon the design you have in your hand now. Once I had all the main pieces put together, I put everything into a 3D program called Blender, where I could fine tune some shapes and get him posed. Once I had the little robot posed, I output an STL file and sent him off to be 3D printed at the nice folks at Shapeways. He is printed on a very fine detailed translucent plastic. I then quickly gave him a very thin coat of primer to help bring out the details. And now a quick warning. This little guy is very fragile. Especially the arms. He may break off if handled roughly. And he really isn’t meant for small children. He could very easily be swallowed and will most like choke whoever tries to eat him. So no kids under 4 years old please. And no production or pre-media artists either. They will stick just about anything in their mouths. It’s rather embarrassing!